I have loved Disney’s The Little Mermaid for as long as I can remember. I loved the music, the characters, and the story. Part of Your World is still my go-to Disney karaoke song. I became especially sentimentally attached to The Little Mermaid at age nine, during my tomboy phase, after my great-aunt Debra gave me a Little Mermaid diary. She said that it reminded her of me because I had red hair, loved to sing, and wanted to be something I wasn’t (again, tomboy phase). I love the childhood nostalgia I experience when I watch The Little Mermaid, now as an adult. But, as an adult, I’ve noticed a few things about the film that I hadn’t during my childhood. And I have to admit that I am disappointed with some of the messages, the parenting, and the horrible logic occasionally demonstrated by the characters. The following is an example of poor parenting and poor logic taken from a scene at the end of the film, right before King Triton restores Ariel to a human form to be reunited with Prince Eric. I have recorded what is actually said in the scene, and in italics I have included how I interpret some of those lines when they are spoken. King Triton: She really does love him, doesn’t she, Sebastian? She really is infatuated with him, isn’t she, Sebastian? Sebastian: Well, it’s like I always say, your majesty; children got to be free to lead their own lives. Well, it’s like I am about to say for the first time, your majesty; teenagers with little life experience and who prove their lack of good judgment by selling their voice and soul to a witch in order to physically changes their bodies for a chance at attracting a man she has never met, should be free to make their own choices. Sure, if you hadn’t gotten involved she’d be a sea slug in the witch’s lair or the entire ocean could belong to someone evil. But, hey, let her make her own choices. King Triton: You, always say that? King Triton: Well then, I guess there’s just one problem left. Well, if I am to use the same caliber of logic as everyone else, then I ought to assume that infatuation is love, and consent to what my 16 year-old daughter wants rather than consider what is in her best interest. But there is still one drawback that I’m willing to admit to. Sebastian: And what’s that, your majesty? King Triton: How much I’m going to miss her. I am going miss my teenaged daughter after I change her into another species, send her off to marry a stranger I know virtually nothing about (and with whom she has never had a spoken conversation), especially since I will probably never get to see her again since we will live in different ecosystems. Is it just me, or is King Triton not thinking this through very well? 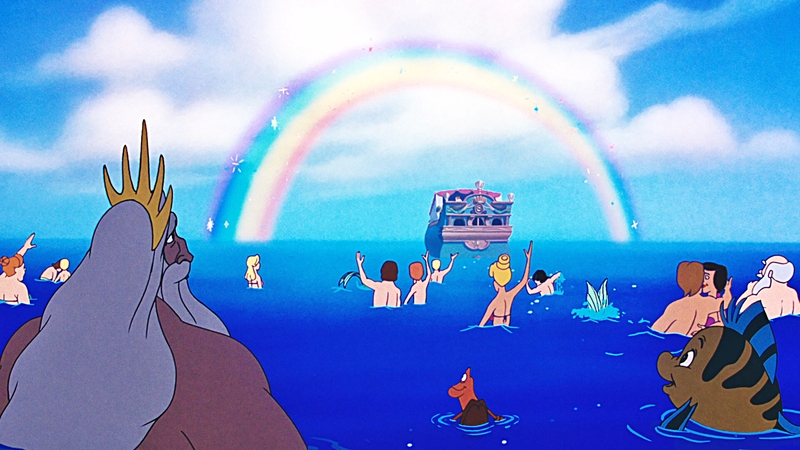 It is interesting to consider how at the beginning of the film, King Triton’s disciplinary style was rather harsh. Okay, extremely harsh. He yelled at her and destroyed all of her valuables. His parenting style in that exchange could be characterized as authoritarian (high control, low warmth). However, by the end of the movie, as illustrated in the scene transcribed above, his parenting style has changed to be permissive (low control, high warmth), authoritarianism’s opposite. Neither style is particularly healthy. According to research, children benefit most from parents who are authoritative. In this style, a parent has a high level of control, alongside a high level of warmth. It is reasonable that King Triton, after recognizing that his authoritarian approach elicited rebellion and acting out, would want to change his strategy. And logically, he would want to do the opposite of what had failed. Unfortunately, he still wasn’t acting in the better interest of his child. Think about it. He just changed his sixteen-year-old daughter’s physical appearance and gave her his blessing to leave home and marry someone that she met three days ago and has never even had a real conversation with. This is not healthy parenting behavior. Similarly, many parents make the error of acting opposite of something that they know didn’t work–perhaps it didn’t work with another child, or perhaps it was hurtful to them when their parents used a particular parenting strategy or style with them. So they swing from one extreme end of the pendulum to the other. They wisely avoid doing what they understand doesn’t work, but end up inflicting a different flavor of hurtfulness by going too far in the opposite direction. There is a need for wisdom and balance, rather than reactive, oppositional, or guilt-driven responses. I realize that it would have made for a lame ending to the movie, but it would have been better parenting if King Triton and Ariel had had a heart-to-heart conversation and if there had been consequences associated with her reckless behavior. Those consequences should not have been destructive to her property or their relationship as was the case in his earlier reaction. But to have no boundaries leads to no safety. Strive to be an authoritative parent. If your sixteen-year-old wants to marry an older man she just met, don’t finance and host a wedding the next day and then send them off to live on the moon. It’s not good parenting, no matter what Disney movies might say. Just because something makes a good story, doesn’t mean it leads to a happy ending. The villain in Disney’s Tangled is a parent…sort of. Mother Gothel, as we know her, receives her designation as a mother when she kidnaps a young child and raises her under the guise of being her biological parent. 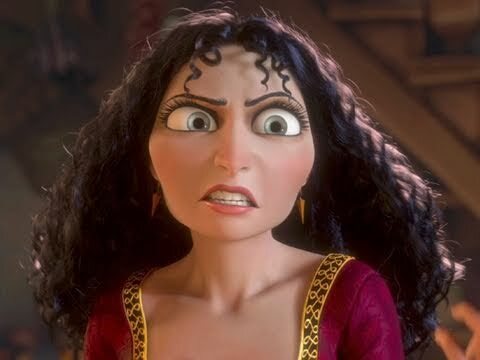 Throughout the film we have glimpses into Mother Gothel’s parenting style, and as would be expected from a villain, it turns out she isn’t a great parent. In fact, she is a highly manipulative parent who uses what is known as psychological control, something common to emotionally abusive relationships. If a parent doesn’t want to hear their child or their child’s ideas, they will accomplish this by changing the subject, interrupting, speaking for them, lecturing, ignoring comments and showing disinterest. This doesn’t allow the child to talk, and it sends the message that what they have to say isn’t important. When a child expresses a feeling, the psychologically controlling parent will often discount their feelings, assign feelings a value (good/bed, right/wrong), use sarcasm or tease the child for feeling how they do. This can cause the child to lack confidence in both what they are feeling and in their ability to understand themselves. It positions the parent as being the expert on what the child feels. The parent may attack the child’s sense of worth and belonging by questioning their loyalty, bringing up past mistakes or embarrassing behaviors, or being condescending or patronizing. This involves laying guilt trips, playing the role of the martyr, or saying that if their child really cared about them, that they would do what they were asked. It causes the child to feel that they deserve to feel badly if they don’t always do what the parent wants. Shaming differs from guilt-induction. Guilt is feeling badly about what you do or don’t do. Shaming is feeling bad about who you are. In shaming, the parent attacks the child’s character and may use insults. This includes threatening to stop loving your child or love them less, or to withdraw your attention as a punishment if the child doesn’t comply. This may be evidenced by turning away in disgust, making disgruntled facial expressions, or physically leaving in order to express displeasure with their child. It makes love seem conditional–as though it has to be earned, and it causes fear that it can be lost. This refers to when a parent vacillates between caring and attacking expressions. Some days they are loving and doting, and then they are accusing and harsh. This is often seen in alcoholic parents. It instills a sense of fear because children don’t know what to expect. It also causes unhealthy expectations about what loving behavior looks like. According to research, psychological control has been found to interfere with the process of self-formation and with becoming able to function independently. Or in other words, it makes it harder to grow up into a confident adult. It has also been associated with anxiety, depression, low self-esteem, acting out, and being impulsive and aggressive. Moral of the story: Don’t use psychological control as your primary parenting style. Sure, there will be times where you will slip up and use a guilt trip or respond in a less-than-optimal way to your child expressing emotion. It happens. You’re human. That won’t ruin your kid. But if these are your go-to ways of getting your child to behave, and you employ them regularly, then you may have a problem. Which means your kid is more likely to end up with problems. There are other parenting styles and other parenting techniques that will help you to help your kids learn to behave AND to be healthy autonomous individuals who feel good about themselves and still want to have a relationship with you when they are grown. Seek them out. Be a hero, not a villain. I believe in you.